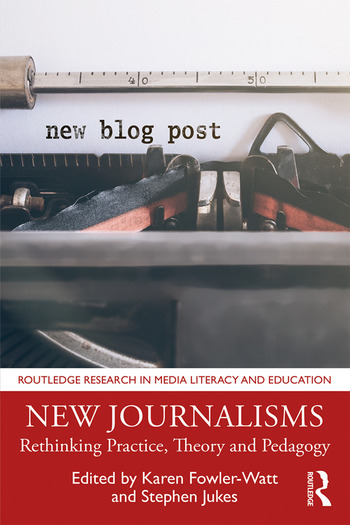 In this current period of uncertainty and introspection in the media, New Journalisms focuses not just on new challenges facing journalism, but also seeks to capture a wide range of new practices that are being employed across a diversity of media. This edited collection explores how these new practices can lead to a re-imagining of journalism in terms of practice, theory and pedagogy, bringing together high-profile academics, emerging researchers and well-known journalism practitioners. The book’s opening chapters assess the challenges of loss of trust and connectivity, shifting professional identity and the demise of local journalism. A section on new practices evaluates algorithms, online participatory news websites and verification. Finally, the collection explores whether new pedagogies offer potential routes to new journalisms. Representing a timely intervention in the debate and providing sustainable impact through its forward-looking focus, New Journalisms is essential reading for students of journalism and media studies. Dr Karen Fowler-Watt is a senior principal academic at Bournemouth University where she is research theme lead for journalism education in the Centre for Excellence in Media Practice. As a BBC journalist and editor for Radio 4 News and Current Affairs, she worked in Moscow, the Middle East, Northern Ireland and the United States. Her research focuses on questions of empathy and voice with specific interest in re-imagining journalism education, trauma awareness and conflict reporting. She works with the Salzburg Academy on Media and Global Change and is engaged in a pedagogy project with Global Voices. Stephen Jukes is Professor of Journalism in the Faculty of Media & Communication at Bournemouth University (BU). He worked in Europe, the Middle East and the Americas as a foreign correspondent and editor for Reuters before moving into the academic world in 2005. His research focuses on areas of objectivity and emotion in news with an emphasis on affect, trauma and conflict journalism. He works with the Salzburg Academy on Media and Global Change, chairs the Dart Centre for Journalism & Trauma in Europe and is a trustee of the Institute for War & Peace Reporting.